Sound Portraits' "Parents at an Execution"
UPDATE: On February 24, 2004, the United States Supreme Court overturned the death sentence of Delma Banks, Jr. by a 7-2 vote, concluding that Banks was denied a fair trial as prosecutors did not disclose key information to the defense. The case has been remanded to a lower court. 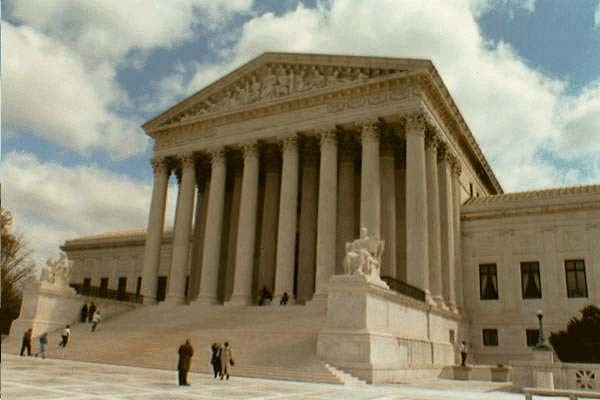 UPDATE: On April 23, 2010, the Supreme Court denied cert. to review Banks' conviction. He now faces a re-sentencing. UPDATE: On Aug. 1, 2012, Banks and the Bowie County prosecutors reached a plea agreement for a life sentence. Banks will be eligible for parole in 2024. Banks v. Dretke (formerly Banks v. Cockrell), No. 02-8286. (To be argued December 8, 2003) In an appeal from the U.S. Court of Appeals for the 5th Circuit, the U.S. Supreme Court granted certiorari in the case of Delma Banks, a Texas death row inmate who maintains that prosecutorial misconduct and ineffective defense counsel denied him a fair trial 23 years ago. The Court will examine the complex history of Banks' appeals and a lower court ruling that held that Banks could not show his attorney's performance affected the outcome of his 1980 trial. Banks' current attorneys assert that their client was poorly represented at trial, that prosecutors withheld key information, and that testimony from two prosecution witnesses was unreliable. (Associated Press, April 21, 2003). (b) the suppressed evidence was immaterial to Banks' death sentence, where the panel neglected to consider that the trial prosecutors viewed the evidence to be of "utmost importance" to showing a capital sentence was appropriate? (2) Did the 5th Circuit act contrary to Strickland v. Washington, and Williams v. Taylor, when it weighed each item of mitigating evidence separately and concluded that no single category would have brought a different result at sentencing without weighing the impact of the evidence collectively? (3) Did the 5th Circuit act contrary to Harris v. Nelsen and Withrow v. Williams in holding that Fed. R. Civ. P. 15(b) does not apply to habeas proceedings because "evidentiary hearings" in those proceedings are not similar to civil trials? Read the amicus brief filed by former FBI Director William Sessions and two former federal appeals court judges stating that Banks' trial was tainted by "uncured constitutional errors" that are "typical of those that have undermined public confidence in the fairness of our capital punishment system." (See Washington Post, March 13, 2003). Read the opinion from the U.S. Court of Appeals for the 5th Circuit (unpublished, August 20, 2002). SOUND PORTRAITS' "PARENTS AT AN EXECUTION" - Listen to the mother of Texas death row inmate Delma Banks, and the parents of Richard Whitehead, the man Banks was convicted of killing, as they reflect on what it has been like waiting as Texas prepared for Banks' execution, which was scheduled for March 12th. See www.soundportraits.com for more information, including photographs of the parents, a message from Delma Banks to his mother, and additional information on Banks' appeal for a stay of execution. "PREVENTING A MISCARRIAGE OF JUSTICE," New York Times, editorial, April 18, 2003.